In our ongoing Collector Spotlight series, we’re taking a closer look at collections and their collectors! 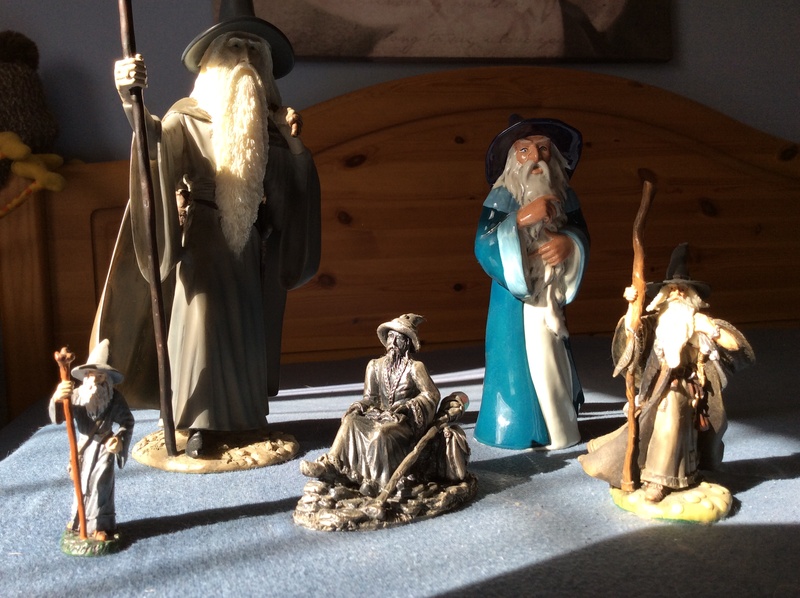 This week, we’re featuring Andy, a longtime Tolkien fan whose collection spans across film memorabilia (both the live action films and the animated ones), video games and board games, and more! Andy has been great about sharing photos of his collection on Twitter (@AndyBirdUK), but we had no idea quite how eclectic it was! Below, you’ll enjoy photos of only a part of his collection and get to know more about Andy. We are so happy to have formed a kinship with collectors like Andy through social media and through our Collector Spotlights. You are truly our people! 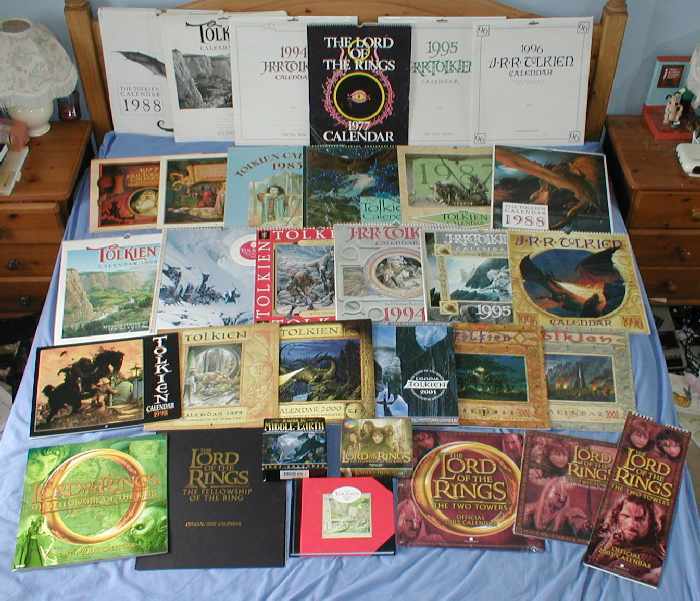 When did you first realize that you were a Tolkien collector? I first met Tolkien’s world at school in 1975 when I was 11 (yes I am old), and we read The Hobbit as a class read. We had a chapter a week and I was captivated; I became an instant fan. I must admit that I was already a Fantasy lover, having experienced Enid Blyton (Enchanted Wood, etc.) and C S Lewis (Narnia) at an earlier age, but I loved The Hobbit most. It took another five years however for me to find The Lord Of The Rings, but once I did, it easily became my all time favourite book. I read it constantly over and over for the next five years until I eventually started to read other Fantasy books and then other fiction. I still read it regularly and enjoy it just as much as ever. It set the standard in Fantasy and no others have come close. I also love The Silmarillion, although I struggled with it the first time I tried to read it; you need to get passed the first bit and then it becomes a wonderfully epic book. Do you remember what was your first Tolkien item? The first Tolkien related items I got, other than the books, were some Citadel war gaming miniatures. I only found a few of these in a small local shop and really liked them as they were based on my favourite book. I had a very poor attempt at painting a some. These didn’t really start me collecting, though. The start of my collection came with the 1991 Tolkien Calendar, illustrated by John Howe, which I think I was given as a Christmas present. From that year on, I made sure I got a Tolkien Calendar each year — two or more a year since the first movie came out. Since I started collecting a bit more vociferously, I have managed to obtain all the previous years calendars back to the first official one from 1973. I think my favourite calendar is the 1992 Centenary one with illustrations by Ted Nasmith, who is my favourite Tolkien artist. 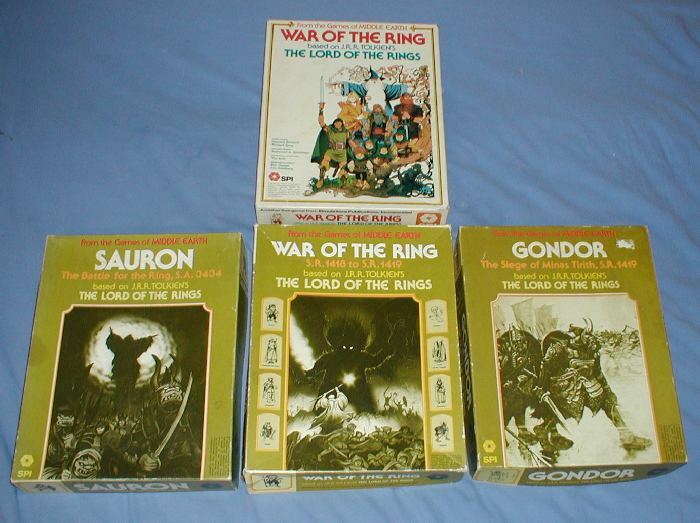 However my first encounter with anything Tolkien, other than the books, was the board game “The War of the Ring” by SPI in 1981 which a friend of mine had. It was an excellent representation of the book and very playable. I did not get my own copy of it until quite a few year later. I now have 7 versions of it, including quite a rare Polish version. Ever since the first calendar, I would get anything Tolkien related I came across, mainly new versions of the books and a calendar each year. I wasn’t aware that there was much else to collect, so didn’t really go looking for items, but I would pick up anything I found. I didn’t come across that much, so it wasn’t very much of a collection for quite a while. It really exploded firstly when the Internet got bigger and eBay took off in the late 90’s. There were a lot of bargains to be had in the early years of eBay, and my Tolkien collection really started to get bigger. The second big increase came when the movies came out; the amount of stuff available was huge and it became impossible to collect everything. How do you decide what you want to collect? I’m interested in anything Tolkien, but there is just too much out there. I just can’t afford everything and don’t have the space to keep it. I already have most of my stuff in storage, which is a real shame. Although I would have loved to, I couldn’t afford to collect the replica stuff (swords, etc.) and also the high quality Weta statues. I also forced myself not to collect the Tolkien Lego which is quite expensive, although I do like it and have a few bits. I’m also not a specialist Tolkien book collector. Again, I can’t afford a lot of the expensive books, although I do have an ok selection. I’m really a Jack of all trades and master of none, having bits of everything. I’m afraid I see things and just can’t resist them. Saying that, I do focus more on some areas. I have quite a few Bakshi movie related items and I also like board games, computer games, vinyl records and calendars. I also have quite a large collection of action figures. You mentioned that most of your Tolkien collection is in storage. What pieces did you keep out because you just had to have them near at hand? I still have a lot of books about — quite a few shelves full. I need to have them available to read and for reference. I have a set of Danbury mint figures in their own display case on the wall. I’ve got a few other figures dotted about the house to cheer me up on a daily basis. I have a Gollum Royal Selangor goblet that I like. And I have the DVDs at hand. I also have anything I’ve just brought and not yet stored away! Which always seems to be a reasonable number of things. Tell us about your collection and some of your favorite items. As I’ve said, I pick up anything I can find (that I can afford), so I have bits and pieces of everything. I have quite a lot of items; I am currently trying to catalogue them and am about half way through. The count so far is just over 1000 items, with another 250 loose war gaming figures. The areas which I do have more of an interest in are firstly board games. I have always liked board games from my childhood and I loved the War of the Ring by SPI, so I have naturally kept an eye open for any other Tolkien games. I have about 100 board games, the highlights being a Polish version of the War of the Ring and a limited edition of The Lord of the Rings (by Fantasy Flight), designed by Reiner Knizia with art work by the Tolkien artist John Howe. It is signed by both of them. I also like vinyl records. 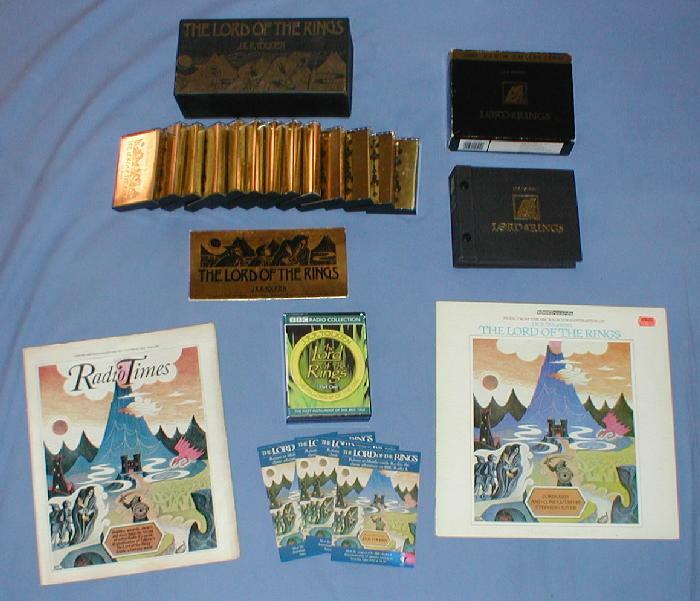 I started collecting these when I found a copy of the music from the wonderful BBC Lord Of the the Rings dramatisation, which I loved. 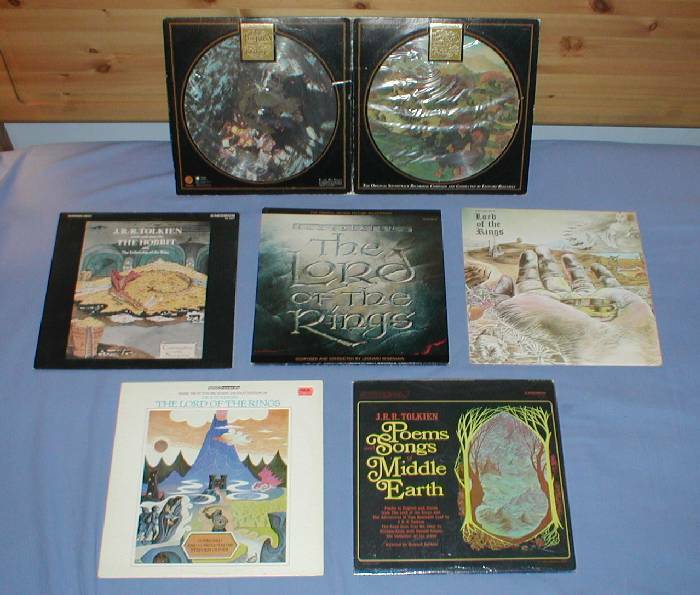 Records is a more limited and obscure area to collect and I have about 25 of these, my favourites being 2 LP’s of Christopher Tolkien reading excerpts from The Silmarillion. Another area I like is items from the Bakshi movie. This, again, is a bit more of a limited area, although I have picked up a fair few of them over the years, so I specifically look out for anything I haven’t got. I have about 60 items including two stand ups of Gandalf and Frodo, an original hand drawn movie frame and a 35mm trailer. I also have a good collection of action figures. 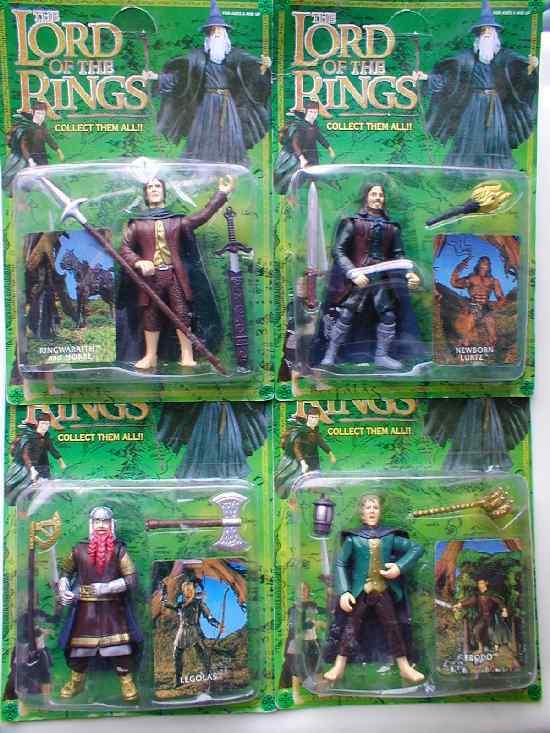 I have all the Toybiz figures, 240 boxes, except the red Two Towers box Arwen and horse which is very rare (if anyone has one and wants to sell then please contact me). I do have a Red Box Gimli, which is quite rare and is perhaps one of the most I’ve paid for an item (it came from Australia). I also have the promotional US Burger King figures and a huge NECA balrog. There are lots of nice boxed sets of figures which I like in this set. I wasn’t originally going to collect all these action figures, but I really liked them. Once I started, it became quite compelling to get them all. My strangest items are also action figures: some quite weird fake Toybiz figures I picked up whilst on holiday in Cyprus (yes, I even keep an eye open for Tolkien items whilst on holiday). 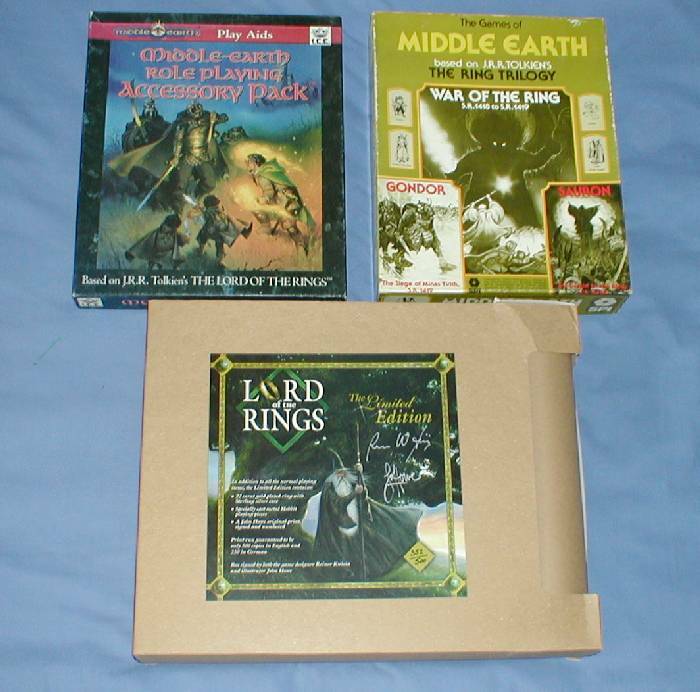 I love lots of items in my collection, but my absolute favourites are my original single volume reading copy of The Lord of the Rings (which is the Tolkien item I would grab first in a fire), my War of the Ring board game and a hand drawn picture of Gandalf, drawn and signed by Sir Ian McKellan (which I won in a charity auction). Which character do you most identify with and why? Do you own any items related to that character? I am a Gandalf fan. I love how subtle a wizard he is, often vulnerable and unsure but with hidden power. I do have quite a few Gandalf items, particularly the aforementioned hand drawn picture. I would love to meet him. My daughter has, he came to her school and when he entered their classroom he said “you must revise for your exams otherwise YOU SHALL NOT PASS” in his booming Gandalf voice — I was so jealous. I have also met a few of the cast from the movies at various conventions. All the cast I have met were very friendly. I particularly liked Sean Astin who was very good with my little son who was with me. I met Billy Boyd at my small town’s library. They had put on a Tolkien day just after the first movie was released. I don’t know how they managed to get Billy Boyd to appear; it was a small event and there were not that many people there. I didn’t have a camera with me but he did sign some books. In total, I have met 12 of the cast so far and would love to meet more. You have collectibles from the older animated films, the newer Peter Jackson films, and even from the Lord of the Rings musical. Even though they can be so different, can you explain what you like and what you decide to collect from each of them? I will basically collect anything Tolkien. I particularly like unusual items — that’s why I like the board games and LP’s. I also like promotional items; they are a bit more unique than commercial items. 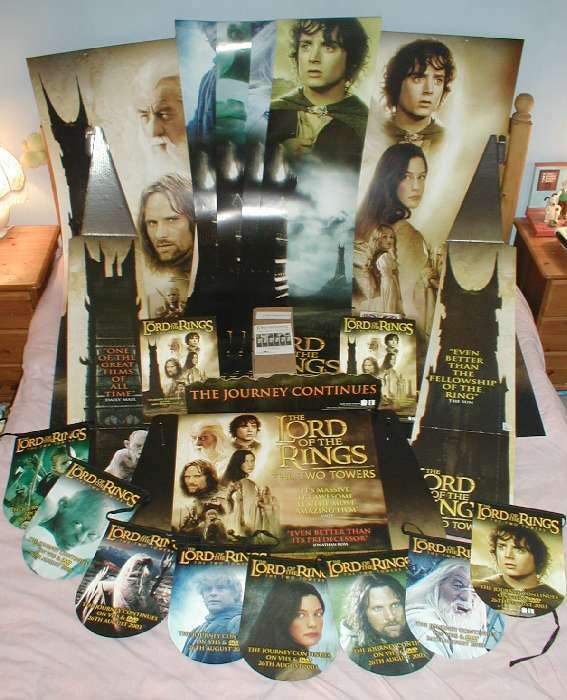 I got the Lord of The Rings musical items when I went to see it in London. It was a pre-opening performance. so I was one of the first to see it. It was very good; it had a revolving stage with areas that also went up and down, which was very cleverly used in the battle scenes. The Ents were also done very well with people on stilts. I’m also a big fan of the BBC dramatisation, in which Ian Holm also starred, this time as Frodo. It follows the book quite well (I think they do better than the films, and I did like the films). I have some BBC items in my collection. What are some Tolkien collectibles that are still on your wishlist? What is it about those that makes them so special to you? So so many things. Particularly the previously mentioned Toybiz Red Two Towers Arwen and Horse. There are some very early Tolkien board games I would love to have. And the Bakshi Knickerbocker Action figures. 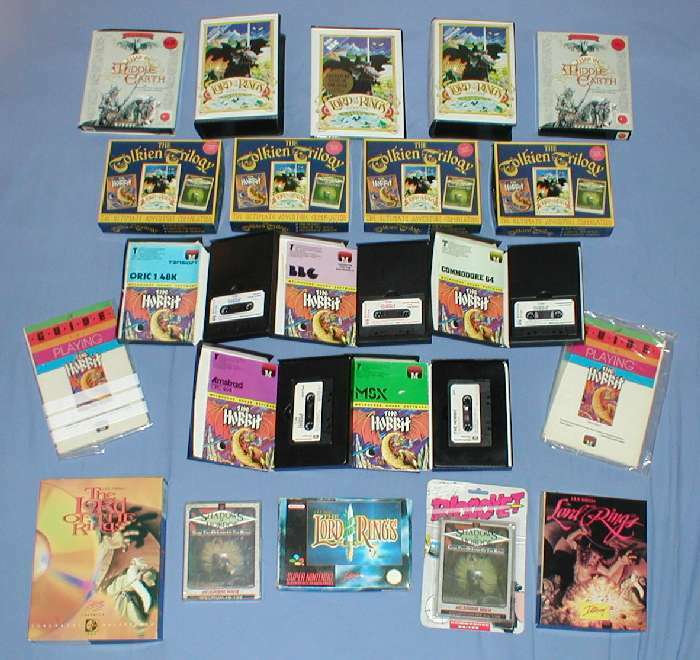 There are also a couple of very early computer games I’m trying to find. Of course, I would love the United Cutlery replica swords and weapons and the Weta statues. I’m very envious of some of the collections of these I have seen. And of course my own hobbit hole in the back garden to keep everything in. Have you ever been approached by someone who wanted to buy a piece of your collection? No I haven’t, in fact, I’ve never really discussed or talked about my collection to many people before. I’m not interested in selling items; it is my collection on a subject I love and I’ve spent a long time putting it together. What do your friends and family think of your collection? How do you explain to non-collectors or non-Tolkien fans why you collect? My friends and family thing I’m mad. They like the books and movies fine, but don’t really understand the collecting. I think the world is split into those people who collect and those who don’t — those who don’t just don’t really understand it and it seems to be impossible to explain to them why I do it. In fact, I’m not sure I really understand why myself. It’s just something I enjoy doing and it’s a subject I love. Finding some new item and knowing you have it in your collection is just a great feeling. Where do you go to find items for your Tolkien collection? I have brought from all sorts of places. High street stores, theatres, internet shops, car boot sales, charity shops etc. eBay has been, and still is, a great way to get hold of things, although there are not so many bargains to be had these days. I do love scouring (a good Tolkien word) car boot sales and charity shops where the occasional real treasure will turn up, which is always more rewarding than shop purchases. Do you have any tips for other collectors? I find that bargains can be had when products are coming to the end of their shelf life; you can often get reduced prices, in shops, on eBay and on other internet stores. But you have to be careful as not all items go through this, so you may miss the ones you really want by leaving it too late. Also, spend the time at car boots, garage sales and charity shops. You won’t find items very often, but you will find items occasionally, sometimes quite unusual and rare and at bargain prices. Also, don’t be afraid to ask stores if you can have any promotional items after they have finished with them. You can get some good items, often free, just by asking. I have just recently been trying to catalogue my collection. It is hard when most of it is in storage. I have been trying to work from old photos. I’m finding it interesting exploring the internet for the various areas, which is how I found the CollectTolkien website. There are some brilliant specialist sites out there (particularly for calendars, board games, music), there are also some great general Tolkien sites. I did have to trawl quite deeply to find details on some areas though, but that too was fun and I have identified some interesting stuff to look out for (another collecting tip). A huge thank you to Andy for sharing photos of his amazing and eclectic collection! After reading all about his items and seeing the photos, are you tempted to start collecting items you never hunted for before? Which of these photos really catches your eye? Here at Collect A Thing, we love seeing nerdy collections and collectibles, and we couldn’t do it without you–the collectors! We started this regular feature to get to know different collectors and their collections (our last spotlight was two weeks ago with Melissa). Are you a Tolkien collector? If you’re interested in sharing your collection with us, please fill out our Contact Form, and we’ll be in touch! Yo have some items that… woow, how you got it ?